Place the ingredients in a food processor and blitz to a rough dough. Tip out onto a rice flour-dusted surface and knead for 3 to 5 minutes, or until smooth. Cut the dough into four pieces, then carefully press a portion out flat with your fingertips and start to roll it out using a pasta machine (cover the remaining portions with a lightly damp tea towel to avoid them drying out). If you are not using a pasta machine, then use a rolling pin and keep plenty of flour on hand to dust with if things become sticky. Try and roll the pasta out as thin as you can without breaking or tearing it. If you are using a machine, then start at the widest setting and roll the dough through it, lightly dusting with the rice flour if it sticks. Roll the pasta through the widest setting a second time, then click the machine down a setting and roll the dough through again. Now’s the time to transform your dough into whichever variety of pasta you like. If you want to make tagliatelle, roll the pasta through the tagliatelle setting on your pasta machine, or use a sharp knife to slice the pasta sheets length ways into long strips (roughly 7mm thick), placing on a flour-dusted tray as you go. To cook, place in a pan of boiling salted water for around 3 minutes, or until al dente, then serve how you like it. So in my search for different gluten-free foods and recipes, I tried to think of what would be most in demand. No one wants a recipe for gluten-free steak or mashed potatoes, because by their very nature, they are gluten-free. I consider those recipes to be almost cheating! But what about things like, breads, cookies, pancakes and cakes? What about… pasta! Now there is something that isn’t a “cheat” recipe that I know gluten-free eaters would definitely want. 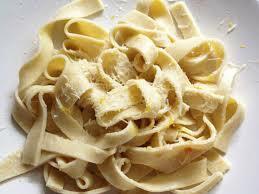 Today’s recipe is for a fresh egg-noodle pasta. The only real trick I find between the gluten-free and regular versions of homemade pasta, is that because the pasta is missing the gluten in one, it’s not as flexible and “bend-y”. This can cause the pasta to crumble or break apart. I suggest working with it the same way that you would with fyllo dough. When you are not actively using the dough or noodles, cover them with a damp tea towel. I would also suggest not getting too fancy with the types of shapes that you make with your pasta, at least not until you’ve made the dough a few times. You don’t need to try and make agnolotti (curved, stuffed pockets of pasta with a crimped edge), the first time… stick with linguine or fettuccine. In a bowl, mix together all of your dry ingredients so they are fully incorporated. On a clean counter top, empty the bowl, and form a “volcano” shaped mountain i.e. : a mountain pile with high sides and a hole in the middle. One at a time, add the eggs into the centre hole that you made, mixing in each egg before adding the next. To mix, move your fingers around the hole you made, gradually making larger circles and bringing in a little more of the flour at a time. Then add the oil the same way. Add the water a little at a time until the dough comes together. You may not need all of it, or you may need a little more. Need the dough together for a few minutes to allow everything to bind, then wrap in plastic wrap and place in a cool place (or fridge) for at least a half an hour. That’s the old way, without using a food processor or pasta maker to bring together a dough. If you think you’re going to make pasta often, you may want to invest in a pasta maker to roll out the dough once it has been made, as this will make your life significantly easier than rolling the dough out by hand! All this talk about pasta however is making me think of sauces… so next week? That’s right, it’s sauce week people! I’ll show you the five “mother” sauces and some variations on each. Until then, enjoy the pasta recipe and have a great weekend.